I'll be completely honest here- I was not tagged to do this post (oops). I actually read this on another lovely bloggers page- Barbara's Life. You can find her post here. I highly recommend you check out her page as well. 1. GREED: What's your most expensive beauty item? Seeing as the majority of my makeup is bought from drugstores- I don't really pay all that much for makeup. I wish I could say I could afford high-end makeup, but unfortunately I'm not that lucky. Mascara. I absolutely love the stuff, but haven't found one that wont smudge, is build-able and isn't gunky. If you have any suggestions; please leave them below. 3. 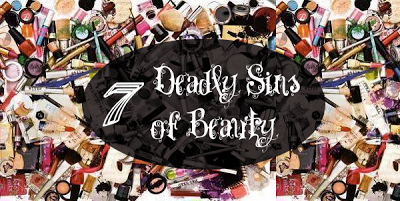 GLUTTONY: What makes up the biggest chunk of your make-up collection? Brand or product? I'll answer both, just because. Product: Lipstick. Without a doubt. I'm completely and utterly obsessed. Brand: Rimmel London because they are affordable, have pretty colours and make nice products. 4. SLOTH: What product do you neglect due to laziness? Primer. I don't think I've ever used it, although I know I should, I just always forget or am in too much of a hurry. Whoops. Depending on how good my skin is, either foundation or lipstick. However, a good winged liner can also do wonders. 6. LUST: Which beauty product is on the top of your list? There are so many! One thing I'm wanting (and hopefully getting for Christmas or my birthday this year) is a set of xoBeauty Brushes. 7. ENVY: Which make-up product/look looks great on others but not on yourself? Makeup- probably coral colours. I haven't been able to make them work to date. However, my biggest beauty (hair) envy is curling with a straightener and fishtail braids. Any woman who can do either or both of these is a goddess.